THE MOST DESTRUCTIVE FLY EVER MADE FOR TROUT, BASS, SALMON, OR RAINBOWS. 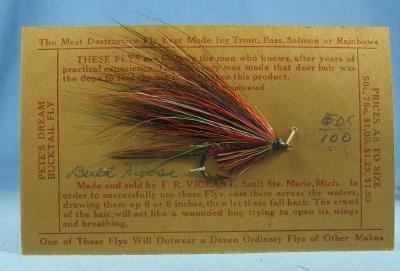 These Flies are built by the man who knows, after many years of practical experience, the discovery was made that deer hair was the dope to fool the big trout- hence this product. 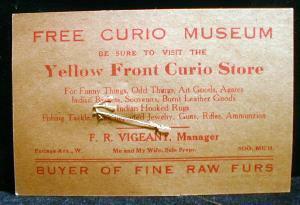 On original presentation card which measures 5 3/4" x 4 1/4". Colors may vary slightly as each is hand tied. We accept VISA, MASTERCARD, DISCOVER, and AMERICAN EXPRESS payment via Paypal. We ship the same day payment is received if paid with a money order. If you make payment with a check, shipping will be delayed. Items Similar To "old Hand Tied Fly Fishing Lure - SNORTING BUCK - Trout Bass Salm..."